If you watch closely you will see one of our daggers & photos used in the montage of photos. It is the rare knife posed with my beige Scottish bonnet. A few years ago i did some cutting and stabbing comparison tests between various brands of production and some custom Fairbairn Sykes daggers. The knife to penetrate the deepest was one by Linder. The test medium was a stack of clean corrugated cardboard. The second best was one of my chisel-tipped knives! Its penetration was within a about an 1/16 of an inch of the thin, Linder knife. The worst knife for penetration was the beautiful custom Damascus knife. I think the coarser surface of the damascus added resistance to the blade. Actually I expected all of them to do better than they did. I think it was Sam Yeaton who commented that the blade's tapered shape would make withdrawal easier. I also think the wedge shape slowed down penetration. This is counter to what I thought would happen. What I learned from this is there is no silver medal for performance between a well made production knife and a well made custom knife simply because of cost. The Linder was a lot cheaper than the custom blades and in combat would probably have fared just as well. The other thing i proved was that my chisel tip design penetrated as good as a needle tipped blade. That was the reason for my test in the first place. For over 40 years I have been collecting fighting knives. Obviously Fairbairn-Sykes have been one of my consuming passions, but fighting knives of all sorts have been of keen interest to me. My daughter and I have trained in several martial arts, empty-hand and many bladed arts. This love of bladed arts has been the impetus behind my collecting, testing, and training, with many diverse size and format knives. Out of my own instructor's curriculum notes I wrote my first book, "The Rhythm of One." The one dominant factor in my collecting was that the knives had to be functional and the best quality available. I have bought my share of junk knives, accidentally, or through deceptive advertising. These experiences have allowed me to build a large body of knowledge on fighting knives, both classic and contemporary, including the Good, the Bad, and the Ugly. You may draw freely from this well of information, which has at times cost me dearly. I hope it might save you from buying a bad knife. 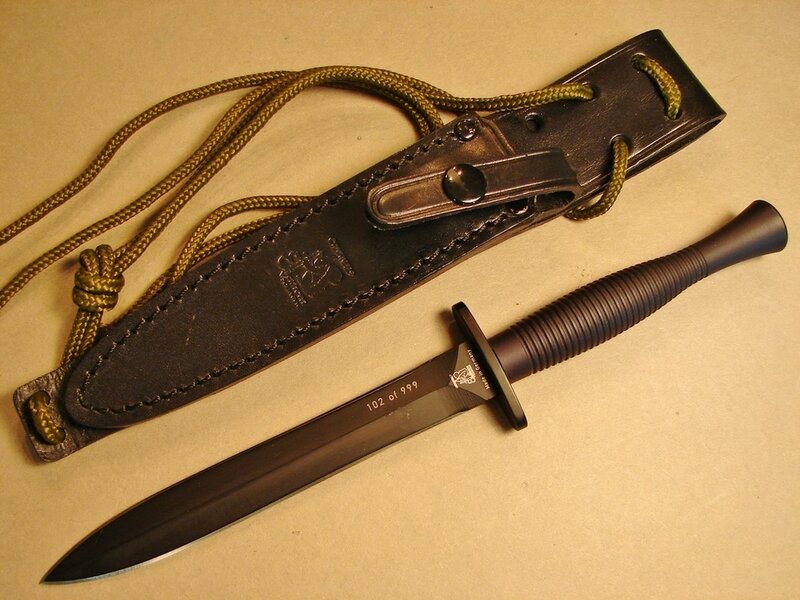 Shown above is a splendid example of a modern adaptation of the F~S fighting knife. 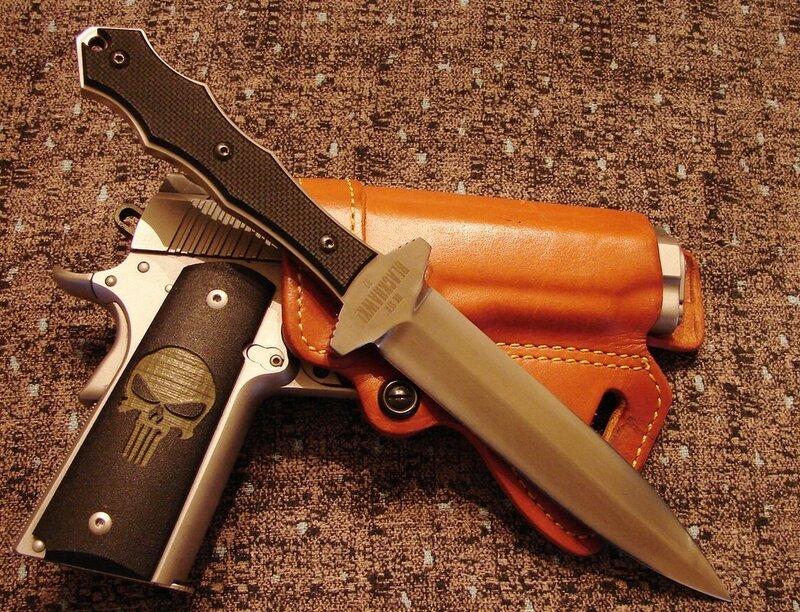 This dagger from Mill-Tac combines many of the best elements of the Fairbairn Sykes and the V-42 stiletto. http://www.mil-tac.com/ I believe it is made in Italy by Fox Cutlery. 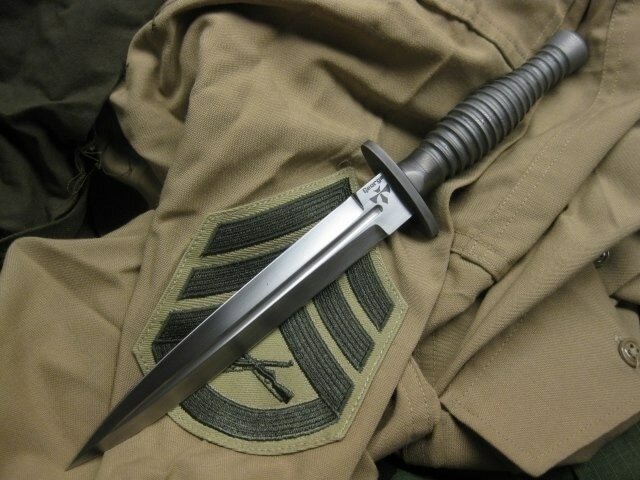 The fighting knife illustrated above is my own design, the Cobra, made by Brent Sandow of Auckland, New Zealand. 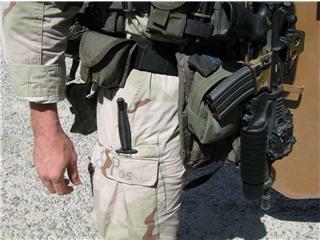 It is not a pretty knife but it is designed for close quarters defense or offense, used in forward or reverse grip. If you practice any FMA like Silat this is a knife you will find exciting to use. To inquire about purchasing a copy please use the contact form on the links and references page. 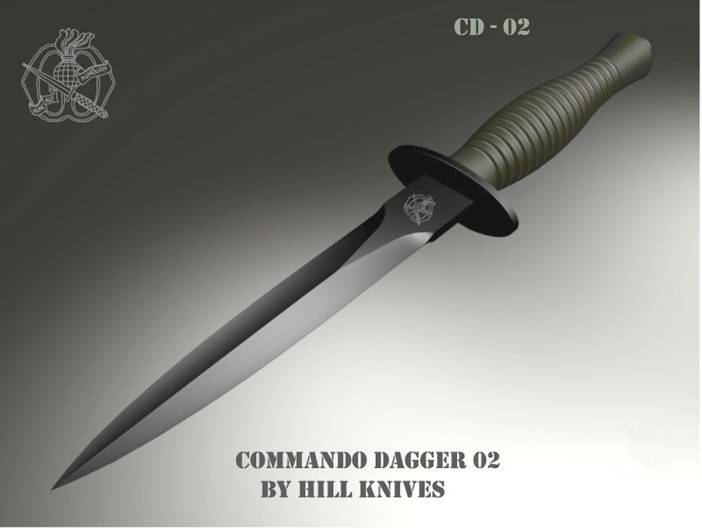 Above: A more elegant modern commando dagger by Hill Knives of the Netherlands. Below: Functional to a fault maybe, but here is the modern Besh Wedge version of an F-S knife. Nearly indestructible but lacking the grace of the original F-S knives. In a practical world grace and elegance are of little value when compared to functionality. A Place For The F~S Today? 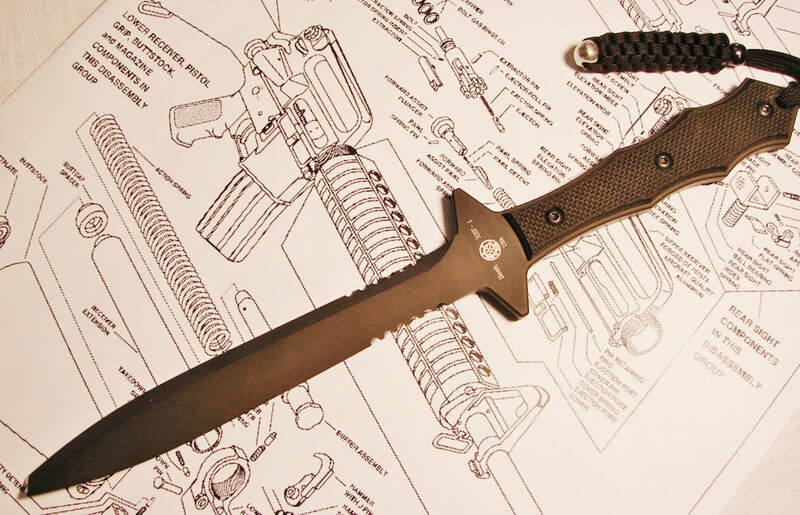 The question often arises about the suitability of the F~S as a modern combat knife. Is the F~S a fragile and undependable knife? Yes and No. 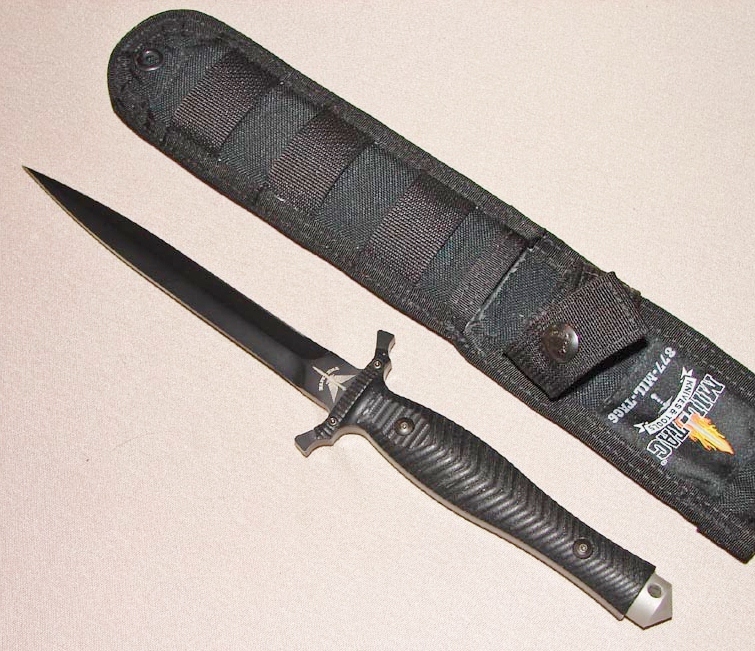 At one time I felt an FS or Gerber MK-II was the ultimate fighting knife but I have since outgrown that fascination. What are its weaknesses? Many F~S knives did fail, but the F~S was not alone in its reputation for failing at a critical moment. The USMC stiletto also had a lot of problems with blades bending or breaking. The USMC Stiletto blades are about 1/2 the thickness of the Wikinson FS. In addition, the handles of the USMC Stiletto were very fragile. It had a superior handle shape, with flattened oval profile, but the material was brittle and only got worse with age. Today it is hard to find one that has not self-destructed. We have one in our collection in pretty good condition and another one with the guard shortened to almost nothing and a broken and re-tipped blade. 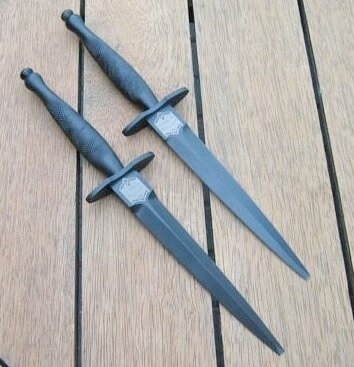 Perhaps some of the best daggers were the OSS stiletto but the early ones had problems with soft blades. The later ones have a brinell mark to test and verify the hardness of each blade. cross-wise between the ribs is a serious faux-pas. Therefore we hear stories of Commandos who either jammed their thumbnails on the guard, or failed to make a lethal strike, because in the dark of night they gripped their knives incorrectly. The thumb plays a major role in orienting your blade so that it lies flat-wise in the hand. Serious knife use requires competent training and practice. Another option to the standard F-S is my Parkinson knife that has a thumb relief ground into both sides of the guard. We read tales of men purposely breaking off the ends of their knives to prevent the needle-like tip sticking in the bones of their enemy, preventing withdrawal of the blade. True or urban legend? I do not know. Obviously the finer the tip the easier it is to accidentally bend or break it. A bent tip would prevent thrusting with the weapon and might require breaking or grinding it off. Peter Parkinson, Brent Sandow, and I collaborated on what I called a Chisel Tip F~S. Look under the category of modern knives for this variation. Most of the broken F~S I have seen were broken near the tip, or up to a half inch back, rather than at the tang, despite its seeming weakness there. Story has it that some of the knives with broken blades were sent back to be refurbished with a new blade. This was said to be done on a regular exchange basis. 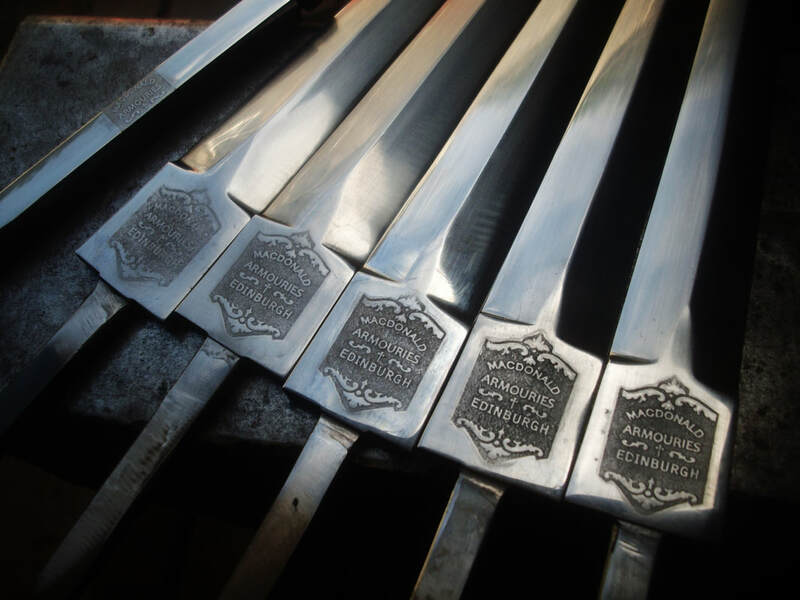 Many later post-war production knives have also suffered bent or broken tips, mostly from abuse and very poorly made blades. Throwing the knives or using them to pry with is a sure receipe for disaster. I have seen some war-time knives bent at the guard, again probably from some bored soldier trying to stick it into a tree or prying open cases. Some of the mild bends might have come during the process of peening over the tang during assembly, especially if the knife was not properly supported in the vise while hammering on it. Below are two of my chisel tip knives. There may be better designs than the F-S today but that does not mean it cannot be used with deadly effectiveness by a well trained soldier. A man properly versed in its use is a virtuoso, a man who can stalk a sentry and execute him quickly and silently. The F~S was not, and is not, truly a fighting knife in the sense of mano-a-mano, but a killing knife. For as long as men go off to war there will always be a place for a Fairbairn Sykes on the warrior’s belt or his web-gear. Above is a Peter Parkinson F~S going on deployment to the "Sandbox." As far different as a knife can be from the F~S, but one that struck terror into the enemy in Burma and Malaysia was the Kukri, carried by the famous troops in the Ghurka Regiments. It is still a viable weapon today. Some of the regimental ones are still found with the British Broad Arrow. This particular copy of a WW-II model came from Kukri House in Nepal. Below: Custom and semi-custom versions from Les George and Spartan Blades, one of my favorite daggers of the 21st century. It’s Brent Beshara here. I’ve just surfed across your page again and love the updates on it. You’ve really put a lot of great work to it. I want to let you know for your Modern Warrior page information. l was the designer for 3 of the knives on your page. 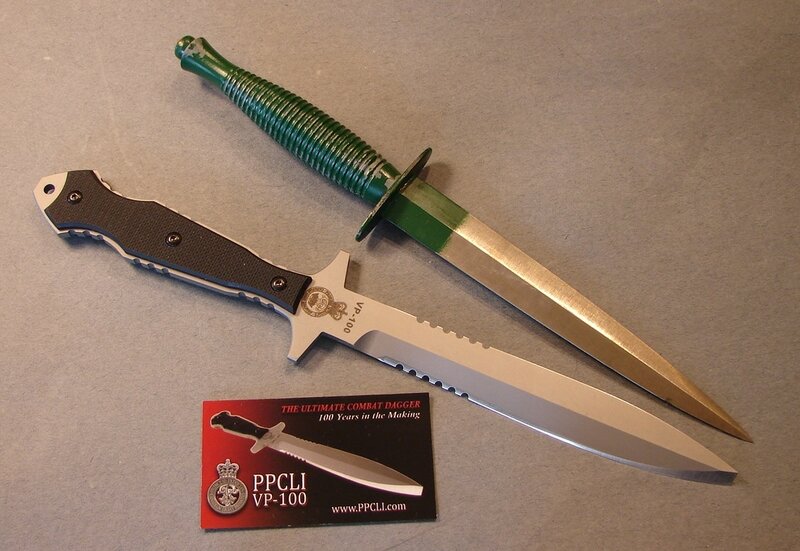 My first design, the XSF-1, my last design the PPCLI VP-100 and the handle portion of the UKSFK fighting dagger. Thanks again for your great work and commitment to recording this vintage information."